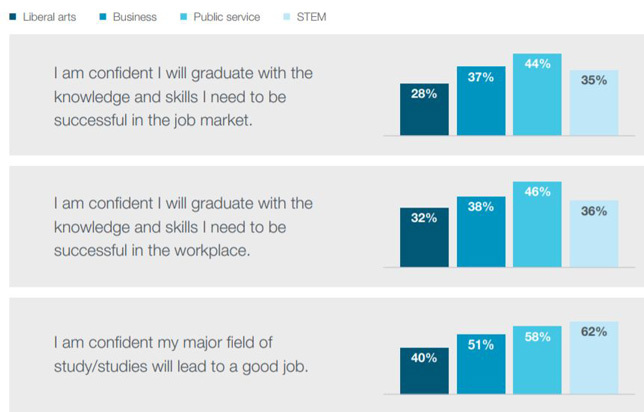 College students in STEM majors are the most likely to be confident regarding their job prospects, according to new survey results from Gallup and Strada Education Networks. But among all students, confidence shrinks as graduation nears. While 56 percent of freshmen expressed confidence in their choice of major, only 51 percent of seniors said the same. And while 36 percent of first-year students said they expected to graduate with the "knowledge and skills" they'd need to be successful in the job market, only 32 percent of seniors were as confident. The 35-page report is available with registration on the Gallup & Strada Education Network website.